For reasons unknown to man nor beast, Ford's been taking its sweet time bringing its full range of infortainment clobber to the UK. But following an announcement at IFA 2012, we can now confirm the full Ford SYNC with MyFord Touch platform will come to Blighty next year. At least, that's what Ford is claiming. But we're sure they said the same thing last year. This time around, it's the upcoming Focus Electric that Ford says will debut the full system. The drill with this latest revision involves enhanced speech and touch controls, including support for machine reading and dictation of text messages and natural language speech input for navigation destinations. The touch part of the package takes the form of an eight-inch touchscreen front and centre in the Focus Electric's console. Exactly how all this differs from the SYNC system that just popped up in the new B-Max, now on sale in the UK, is something we'll be looking into more closely. Look out for our hands on with the B-Max shortly. Ford is also bigging up the benefit to SYNC derived from partnerships with consumer electronics specialists. The platform itself is based on an embedded build of Microsoft Windows, which hasn't historically been something you'd want to show off about. Elsewhere, Gracenote provides a database for CD ripping, which is a bit 1998. More critically, navigation expertise comes from NAVTEQ, with Nuance providing the voice recognition gubbins. Sony is in the mix, too, helping out with audio, while ViaMichelin sorts the Points of interest database. 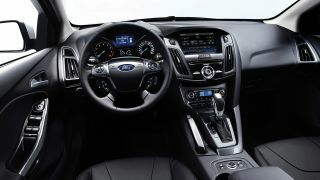 "By harnessing the experience and expertise of the finest hardware and software manufacturers from a variety of fields, Ford is developing a system that is far ahead of the game and will continue to be thanks to its upgradeable design," quothe Jason Johnson, supervisor for infotainment and connectivity, Ford of Europe. If nothing else, it just goes to show how complex in-car technology has become. You can find out more about SYNC with MyFord touch in this official video. And finally...While we're on the subject of the upcoming Focus Electric, Fords says it will launch with a new user interface known as Smartgauge. According to Ford, the interface involves butterflies appearing on-screen to reward efficient driving. Smartgauge also calculates and displays range based on remaining energy; the driver's unique vehicle use across braking and acceleration inputs, and the use of accessories such as climate control and audio systems. The idea is enable owners to monitor, manage and reduce energy consumption, and maximise vehicle range. All thoroughly right on, we're sure you'd agree.